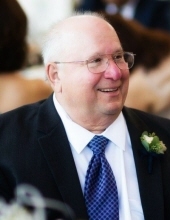 CASLMON, David W. "Dave" -- Age 71, of Fenton, died October 16, 2018. A Memorial Dinner will be held at a later date. Arrangements provided by Sharp Funeral Homes, Fenton Chapel, 1000 Silver Lake Rd., Fenton. Dave was born February 11, 1947 in Flint the son of Beryl and Thelma (Smith) Caslmon. He proudly served in the U.S. Marine Corps for four years. Dave was employed as a machinist. He loved U of M football. Surviving are: wife, Beth; sons, David (Dawn) Caslmon, Tim (Roma) Caslmon; 6 grandchildren; and sister, Becky Caslmon. Dave was preceded in death by his parents. Tributes may be shared at www.sharpfuneralhomes.com. To send flowers or a remembrance gift to the family of David W. "Dave" Caslmon, please visit our Tribute Store. "Email Address" would like to share the life celebration of David W. "Dave" Caslmon. Click on the "link" to go to share a favorite memory or leave a condolence message for the family.